Perfect for the holiday season, beautifully presented and wrapped, our baskets are always a great gift idea. Pictured left, our favorite holiday drum baskets! Product selection varies. All fruit baskets are “presentation-ready” — the freshest seasonal fruit arranged in a pyramid shape, covered with cellophane and tied at the top with a large bow. A gift card can be attached. All baskets are made to order. Please give at least 2 hours notice for pickup. Fruit baskets are not shippable. We do deliver within Acton as well as to Emerson Hospital. There is a $20.00 delivery fee in addition to the price of the fruit basket. 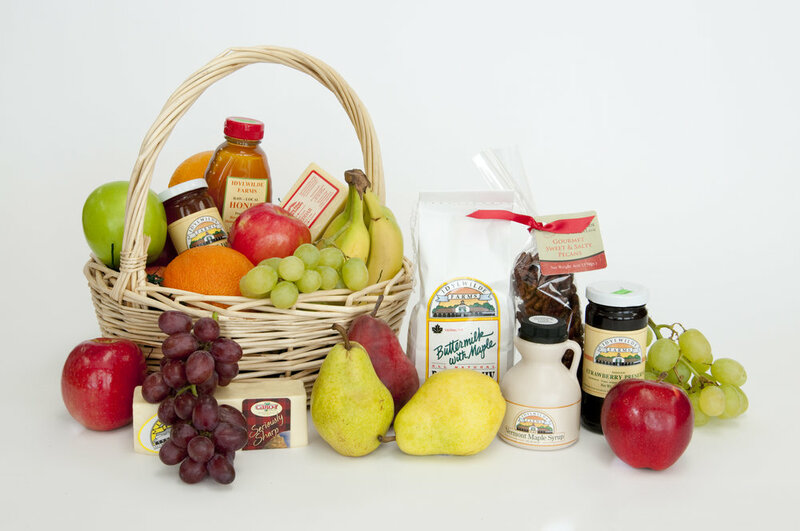 Deliverable fruit baskets begin at $39.95 plus the delivery fee. Please call 978.263.5943 to place an order. Don't forget, we are closed on Tuesdays. Approximately 10 pieces of seasonal fruit, a bunch of grapes, a jar of Idylwilde Farm labeled preserves and a bag of hard candy. *No delivery on this size. No Add-ons. Approximately 18 pieces of larger seasonal fruit, a bunch of grapes, a jar of farm labeled preserves and a bag of hard candy. Approximately 24 pieces of seasonal fruit, a bunch of grapes, a jar of farm labeled preserves, mixed nuts, cheese, crackers and a bag of hard candy. Approximately 24 pieces of seasonal fruit, a bunch of grapes, a jar of farm labeled preserves, cheese, crackers, bag of hard candy, and a bottle of wine. Approximately 25 pieces of fancy fruit, a whole pineapple, a bunch of grapes, cheese and crackers, chocolate covered cranberries, Williamsburg peanuts, hard candy, preserves. $125.00 **** Seasonal, not available for winter months. Approximately 25 pieces of seasonal fruit, a whole pineapple, bunch of grapes, bottle of wine, cheese and crackers, Ava Marie chocolate turtles, Williamsburg peanuts, hard candy and preserves. Gift boxes contain Sweet Sloops, Barque Sarah (toasted almonds in milk chocolate), Periwinkles (solid milk chocolate), Sweet Shells (orange crunch in dark chocolate), Marblehead Mints (peppermint crunch in dark chocolate) and Sand Dollars (creamy caramel with dark chocolate). Large or small assortments available. Carolyn's spiced pecans have been coated with the secret recipe of spices and roasted since Carolyn Schaefer started to make the award winning pecans in her own kitchen back in 1989. There is no nut on the market like it. These delicious full bodied pecans from the South are available in various sizes for snacking, hostess gifts, corporate gifts or for any occasion. Even those who don't usually enjoy pecans, find these to be very addictive! We have a variety of regular, flavored and decaffeinated coffees. Holiday packaging makes it a perfect addition to any gift basket!